Recently, Apple announced its new augmented reality (AR) library named ARKit. For many, it looked like just another good AR library, not a technology disruptor to care about. However, if you take a look at AR progress in the past couple of years, one shouldn’t be too quick to draw such conclusions. In this post, we will create a fun ARKit example project using iOS ARKit. 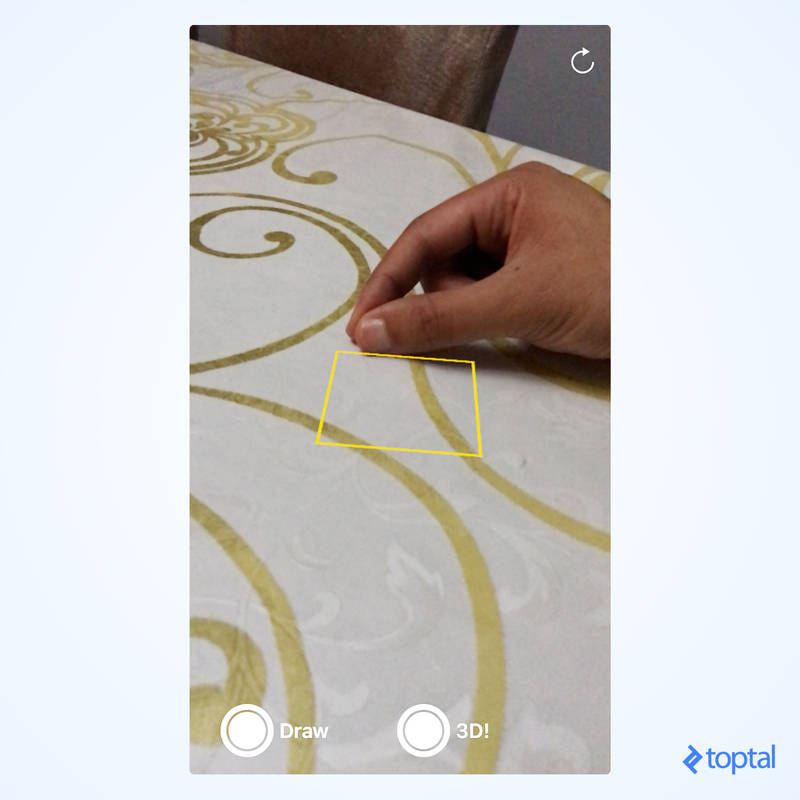 The user will place his fingers on a table as if they were holding a pen, tap on the thumbnail and start drawing. Once finished, the user will be able to transform their drawing into a 3D object, as shown in the animation below. The full source code for our iOS ARKit example is available at GitHub. Why Should We Care about iOS ARKit Now? Every experienced developer is probably aware of the fact that AR is an old concept. We can pin down the first serious development of AR to the time developers got access to individual frames from webcams. Apps at that time usually were used to transform your face. However, humanity didn’t take long to realize that transforming faces into bunnies wasn’t one of their most imminent needs, and soon the hype faded! I believe AR has always been missing two key technology leaps to make it useful: usability and immersion. If you traced other AR hypes, you will notice this. For instance, the AR hype took off again when developers got access to individual frames from mobile cameras. Beside the strong return of the great bunny transformers, we saw a wave of apps that drop 3D objects on printed QR codes. But they never never took off as a concept. They were not augmented reality, but rather augmented QR codes. Then Google surprised us with a piece of science fiction, Google Glass. Two years passed, and by the time this amazing product was expected to come to life, it was already dead! Many critics analyzed the reasons for the failure of Google Glass, putting the blame on anything ranging from social aspects to Google’s dull approach at launching the product. However, we do care in this article for one particular reason - immersion in the environment. While Google Glass solved the usability problem, it was still nothing more than a 2D image plotted in the air. Tech titans like Microsoft, Facebook, and Apple learned this harsh lesson by heart. In June 2017, Apple announced its beautiful iOS ARKit library, making immersion its top priority. Holding a phone is still a big user experience blocker, but Google Glass’s lesson taught us that hardware is not the issue. I believe we are heading towards a new AR hype peak very soon, and with this new significant pivot, it could eventually find its home market, allowing more AR app development to become mainstream. This also means that every augmented reality app development company out there will be able to tap into Apple’s ecosystem and user base. But enough history, let us get our hands dirty with code and see Apple augmented reality in action! ARKit provides two main features; the first is the camera location in 3D space and the second is horizontal plane detection. To achieve the former, ARKit assumes that your phone is a camera moving in the real 3D space such that dropping some 3D virtual object at any point will be anchored to that point in real 3D space. And to the latter, ARKit detects horizontal planes like tables so you can place objects on it. So how does ARKit achieve this? This is done through a technique called Visual Inertial Odometry (VIO). Don’t worry, just like entrepreneurs find their pleasure in the number of giggles you giggle when you figure out the source behind their startup name, researchers find theirs in the number of head scratches you do trying to decipher any term they come up with when naming their inventions - so let’s allow them to have their fun, and move on. VIO is a technique by which camera frames are fused with motion sensors to track the location of the device in 3D space. Tracking the motion from camera frames is done by detecting features, or, in other words, edge points in the image with high contrast - like the edge between a blue vase and a white table. By detecting how much these points moved relative to each other from one frame to another, one can estimate where the device is in 3D space. That is why ARKit won’t work properly when placed facing a featureless white wall or when the device moves very fast resulting in blurred images. As of the time of writing of this article, ARKit is part of iOS 11, which is still in beta. So, to get started, you need to download iOS 11 Beta on iPhone 6s or above, and the new Xcode Beta. We can start a new ARKit project from New > Project > Augmented Reality App. However, I found it more convenient to start this augmented reality tutorial with the official Apple ARKit sample, which provides a few essential code blocks and is especially helpful for plane detection. So, let us start with this example code, explain the main points in it first, and then modify it for our project. First, we should determine which engine we are going to use. ARKit can be used with Sprite SceneKit or Metal. In the Apple ARKit example, we are using iOS SceneKit, a 3D engine provided by Apple. Next, we need to set up a view that will render our 3D objects. This is done by adding a view of type ARSCNView. ARSCNView is a subclass of the SceneKit main view named SCNView, but it extends the view with a couple of useful features. It renders the live video feed from the device camera as the scene background, while it automatically matches SceneKit space to the real world, assuming the device is a moving camera in this world. In the code above, we start by setting ARKit session configuration to detect horizontal planes. As of writing this article, Apple does not provide options other than this. But apparently, it hints to detecting more complex objects in the future. Then, we start running the session and make sure we reset tracking. By this point, if you run the app, you should see the focus square over the camera stream searching for a horizontal plane. In the next section, we will explain how planes are detected, and how we can position the focus square accordingly. ARKit can detect new planes, update existing ones, or remove them. In order to handle planes in a handy way, we will create some dummy SceneKit node that holds the plane position information and a reference to the focus square. Planes are defined in the X and Z direction, where Y is the surface’s normal, i.e., we should always keep our drawing nodes positions within the same Y value of the plane if we want to make it look as if it is printed on the plane. The callback function provides us with two parameters, anchor and node. node is a normal SceneKit node placed at the exact position and orientation of the plane. It has no geometry, so it is invisible. We use it to add our own plane node, which is also invisible, but holds information about the plane orientation and position in anchor. So how are position and orientation saved in ARPlaneAnchor? Position, orientation, and scale are all encoded in a 4x4 matrix. If I have the chance to choose one math concept for you to learn, it will undoubtedly be matrices. Anyway, we can circumvent this by describing this 4x4 matrix as follows: A brilliant 2-dimensional array containing 4x4 floating point numbers. By multiplying these numbers in a certain way by a 3D vertex, v1, in its local space, it results in a new 3D vertex, v2, that represents v1 in world space. So, if v1 = (1, 0, 0) in its local space, and we want to place it at x = 100 in world space, v2 will be equal to (101, 0, 0) with respect to world space. Of course, the math behind this becomes more complex when we add rotations about axes, but the good news is that we can do without understanding it (I highly recommend checking the relevant section from this excellent article for an in-depth explanation of this concept). checkIfObjectShouldMoveOntoPlane checks if we already have objects drawn and checks whether the y-axis of all these objects matches that of the newly detected planes. sceneView.hitTest searches for real-world planes corresponding to a 2D point in the screen view by projecting this 2D point to the nearest underneath plane. result.worldTransform is a 4x4 matrix that holds all transform information of the detected plane, while result.worldTransform.translation is a handy function that returns the position only. Now, we have all the information we need to drop a 3D object on detected surfaces given a 2D point on the screen. So, let’s start drawing. Let us first explain the approach of drawing shapes that follows a human’s finger in computer vision. Drawing shapes is done by detecting every new location for the moving finger, dropping a vertex at that location, and connecting each vertex with the previous one. Vertices can be connected by a simple line, or through a Bezier curve if we need a smooth output. For simplicity, we will follow a bit of a naive approach for drawing. For every new location of the finger, we will drop a very small box with rounded corners and almost zero height on the detected plan. It will appear as if it is a dot. Once the user finishes drawing and selects the 3D button, we will change the height of all dropped objects based on the movement of the user’s finger. You will notice in the above code that we translate the geometry along the y-axis by half the height. The reason for this is to make sure that the object’s bottom is always at y = 0, so that it appears above the plane. virtualObjectManager is a class that manages drawn points. In 3D mode, we estimate the difference from the last position and increase/decrease the height of all points with that value. Up until now, we are drawing on the detected surface assuming the virtual pen is at the center of the screen. Now for the fun part—detecting the user’s finger and using it instead of the screen center. One of the cool libraries that Apple introduced in iOS 11 is Vision Framework. It provides some computer vision techniques in a pretty handy and efficient way. In particular, we are going to use the object tracking technique for our augmented reality tutorial. Object tracking works as follows: First, we provide it with an image and coordinates of a square within the image boundaries for the object we want to track. After that we call some function to initialize tracking. Finally, we feed in a new image in which the position of that object changed and the analysis result of the previous operation. Given that, it will return for us the object’s new location. We are going to use a small trick. We will ask the user to rest their hand on the table as if they are holding a pen, and to make sure their thumbnail faces the camera, after which they should tap on their thumbnail on the screen. There are two points that need to be elaborated here. First, the thumbnail should have enough unique features to be traced via the contrast between the white thumbnail, the skin, and the table. This means that darker skin pigment will result in more reliable tracking. Second, since the user is resting their hands on the table, and since we are already detecting the table as a plane, projecting the location of the thumbnail from 2D view to the 3D environment will result in almost the exact location of the finger on the table. The trickiest part above is how to convert the tap location from UIView coordinate space to the image coordinate space. ARKit provides us with the displayTransform matrix that converts from image coordinate space to a viewport coordinate space, but not the other way around. So how can we do the inverse? By using the inverse of the matrix. I really tried to minimize use of math in this post, but it is sometimes unavoidable in the 3D world. Finally, we will use self.lastFingerWorldPos instead of screen center when drawing, and we are done. 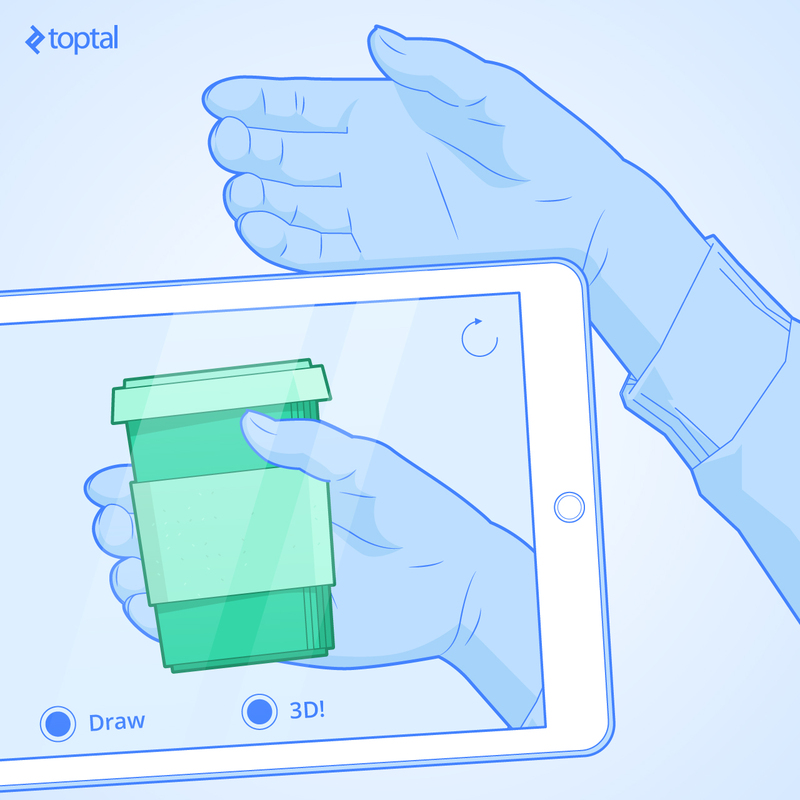 In this post, we have demonstrated how AR could be immersive through interaction with user fingers and real-life tables. With more advancements in computer vision, and by adding more AR-friendly hardware to gadgets (like depth cameras), we can get access to the 3D structure of more and more objects around us. Although not yet released to the masses, it is worth mentioning how Microsoft is very serious to win the AR race through its Hololens device, which combines AR-tailored hardware with advanced 3D environment recognition techniques. You can wait to see who will win this race, or you can be part of it by developing real immersive augmented reality apps now! But please, do humankind a favor and don’t change live objects into bunnies. What features does Apple ARKit provide to developers? ARKit allows developers to build immersive augmented reality apps on iPhone and iPad by analyzing the scene presented by the camera view and finding horizontal planes in the room. How can we track objects with Apple Vision library? Apple Vision library allows developers to track objects in a video stream. Developers provide coordinates of a rectangle within initial image frame for the object they want to track, and then they feed in video frames and the library returns the new position for that object. How can we get started with Apple ARKit? Augmented reality is the process of overlaying digital video and other CGI elements onto real-world video. Creating a quality CGI overlay on video captured by a camera requires the use of numerous sensors and software solutions. What is the use of augmented reality? Augmented reality has numerous potential applications in various industries. AR can be used to provide training in virtual settings that would otherwise be difficult to recreate for training purposes, e.g. spaceflight, medical industries, certain engineering projects. What is difference between VR and AR? While AR is based on the concept of overlaying CGI onto real-world video, VR generates a completely synthetic 3D environment, with no real life elements. As a result, VR tends to be more immersive, whereas AR offers a bit more flexibility and freedom to the user. hmm, got the demo to produce the square but couldn't get a pen dot to start drawing ? Really great post. I want to resize the focus area in the ARKit, but Its not working. Can you help me out in this case ? It did work for me in Beta 5 of Xcode, and without any errors. You can just apply the fixes suggested on XCode. Apple made some property and class renaming on the latest version of the Beta build. Great post! One adjustment I would make though is that you don't need to assign a new ARSession object to the ARSCNView, it already will come with an ARSession object, you simply need to call .run() with the appropriate session configuration to start the session. I tried doing that but then it keeps giving me more errors. For the Value of type ARPointCloud has no member __points it asks if i mean points. I change it to that and it gives me ARPointCloud has no member points did you mean __points? It does this with all of the errors that I have in the screen shot above. Also it keeps asking me to add the missing cases to the switch statement in the ARCamera.TrackingState extension. I'm on Xcode beta 5 and I have the 7 plus and iPad pro all up to date on firmware. have you had any luck getting this to work yet? Thanks. I will check this. It was so in the sample code provided by Apple. I'm currently using Xcode beta 5 and and the newest beta iOS. For some reason I am still getting these errors. The starter project you're using from Apple must be different from the one that's available now, makes it impossible or very difficult to follow along. Consider updating this tutorial to start with the built-in Xcode template, that avoids issues in the future when Apple's starter project is undoubtedly updated and lessens the amount of pre-written code that keeps readers from actually learning what they're doing. Otherwise this would be an amazing tutorial! Really awesome guide. Even though there's been several changes this was a solid read for understanding *how* ARKit works exactly and some solid practices. Thank you! Osama has over 8 years developing iOS/Mac apps, leading technical teams, and co-founding a startup that produces high-quality apps—garnering more than 10 million users worldwide. He enjoys challenging technical problems, diving into non-comfort zones, creating product designs with the perfect balance between technical and business perspectives, and leading technical teams for maximum productivity and an enjoyable work culture.